The America the Beautiful coin series is a new product offered by the US Mint, debuting in 2010. Each coin in the series weighs 5 troy ounces, and is composed of .999 fine silver. The most interesting facet of this coin program is that each year, five unique designs will be released, each featuring a different USA National Park. Read on to learn more about the coin series’ unique designs, mintage, and market demand. In 2008, the US Government approved the America the Beautiful Quarters program, which was intended to produce a series of 56 quarters honoring national parks in the USA. To complement the quarters, the US Mint will also be producing a series of 56 5 troy oz silver bullion coins. As most silver coins are one troy ounce, these five ounce offerings are much bigger than investors may expect. With a diameter of 3 inches, these coins are much larger than 1 oz American Silver Eagles, for instance. The larger face of the coin allowed the designers much more freedom and detail when crafting the images and intricacy, resulting in truly stunning coins. 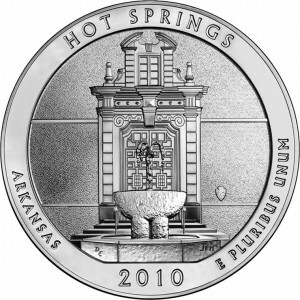 Each coin depicts a unique aspect of the national park or preserve, making these products a bit of a collector’s item. The US Mint sells these coins directly to the public at USMint.gov, but the general public is usually best off buying from an online retailer, as retailers are able to buy from the Mint at discounted prices and then pass those discounts down to the retail consumer. Although the 5 oz ATB coins do carry a currency value of $0.25, their value based on silver content and collectibility far surpasses their standard currency worth. Most retailers will sell the coins for the spot price of silver, plus a premium of $3-$5 to account for the coin’s intricacy and value as a collectible. A common way to purchase America the Beautiful coins is to purchase a five coin set, which often includes a nice display case to protect and store the coins. For a collector, this is perfect as you can buy the set each year and easily accumulate the entire 56-coin run once they have all been released.